It was pointed out to me recently that there are many in the world who have never, and may never actually handle a real Heckler & Koch firearm, and that they would like to know what the sight picture looks like. It had never dawned on me. For the HKPRO experience to be as complete as possible, viewer input is so important. Therefore, this page is for those who may never get to handle the best tactical firearms on Earth. 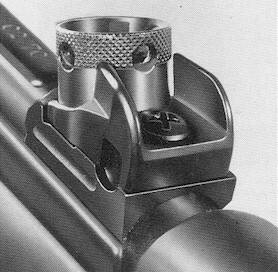 To adjust elevation: Look down into the rear sight drum and you will see four vertical grooves runing up and down inside the drum. 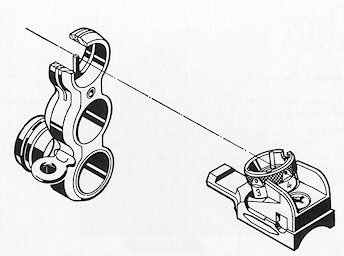 Opposing spring loaded catch bolts can be seen pressing outward from the spindle into an opposing pair of the vertical grooves. Slide the "fingers" of the sight adjusting tool down into the same two grooves where the catch bolts are located until the fingers rest firmly on the catch bolts. 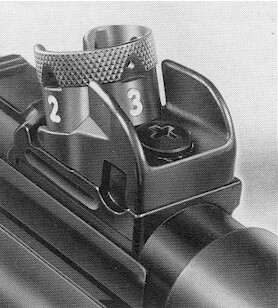 While pressing the sight adjustment tool down, slide the screwdriver shaft into the rear of the sight adjusting tool as far as it will go. The screwdriver shaft cams the fingers together, which squeezes the catch bolts out of engagement with the sight drum and back into the body of the spindle. With one hand, hold the tool and screwdriver still, and now you will be able to rotate the outer sight drum either up or down on the spindle to change elevation. 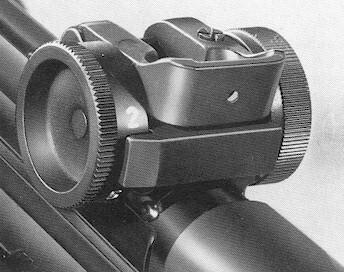 When you remove the sight adjusting tool from the sight, the catch bolts will pop back out again and engage the sight drum at the point you have chosen to set the elevation. You can now rotate the entire sight drum and spindle assembly together back to the appropriate range setting for the distance you are shooting at. To adjust windage: Use the Phillips head screwdriver to loosen the clamping screw at the top rear of the sight, 3/4 of one turn. Now with the screwdriver, turn the adjusting screw, which is located at the right rear of the sight, clockwise to move the bullet point of impact to the left or counterclockwise to move the point of impact to the right. After making the windage adjustment, retighten the clamping screw.